The Palazzo Pallavicini Rospigliosi in Rome was the splendid setting for the presentation of Generali in History. Tales from the Archive on 12 September. The two volumes, Nineteenth Century and Twentieth Century, are published by Marsilio in association with Assicurazioni Generali and contain a preface by Paolo Mieli. They draw on documents from company archives to chronicle almost 200 years of activity. 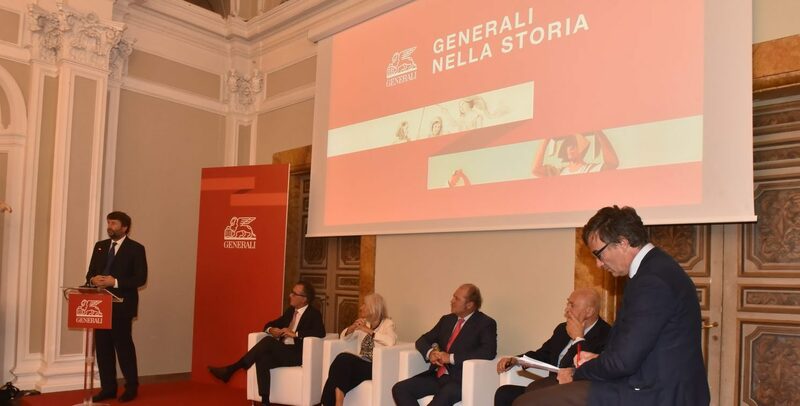 Top managers from Generali attended the event, accompanied by Dario Franceschini, Minister for Cultural Heritage and Tourism, and leading figures from the worlds of Italian finance and economics. The audience heard Philippe Donnet, Generali Group CEO, Marta Dassù of the Aspen Institute, Paolo Magri of the Italian Institute for International Political Studies, and the historian and journalist Paolo Mieli, in a stimulating discussion chaired by RAI journalist Giorgio Zanchini and introduced by Cesare de Michelis, president of Marsilio publishing house. Various episodes from the Generali story were used to introduce discussion of various matters of current interest, such as the insurance industry’s importance in modern society and the company’s role on the national and, particularly, international stages – a glimpse of the past as an aid to understanding the present. The discussion highlighted the many ways in which this work can be a starting point for examination of Italy’s economic history and Europe’s political, and even geopolitical, history over the last two centuries, and how the story of an enterprise that has been able to innovate and reinvent itself, while remaining true to its roots, forms a chapter in the socio-political history of Europe. It was the panel’s unanimous view that even non-specialists will appreciate and enjoy these volumes, with their extraordinary range of imagery. Closing the evening, Mr Franceschini paid tribute to the speakers, emphasising that corporate archives, an asset of major importance, are fundamental to the history of their creators and form an exceptional resource for purposes of research. Read here Generali’s press release.